Direct from my Things-I'm-Not-Supposed-to-be-Working-On File, allow me to present Subject A: Cozy sportweight socks worked in my own handspun (the grey/pink/white/blue/brown bits) and a comparable weight of Zwool from Zeilinger's in Frankenmuth, MI. Subject A has been known to answer to the name of "Walkerville." Basic socks with a hearty cuff-- rustic and comfy and warm. Yes, there will be a pattern. OK! I like those colors - good show! April 19, 2011 at 2:10 p.m.
April 19, 2011 at 3:51 p.m. I love pulling things from my What-I'm-Not-Supposed-to-be-Knitting File -- or should I say, bin. April 21, 2011 at 9:08 p.m. 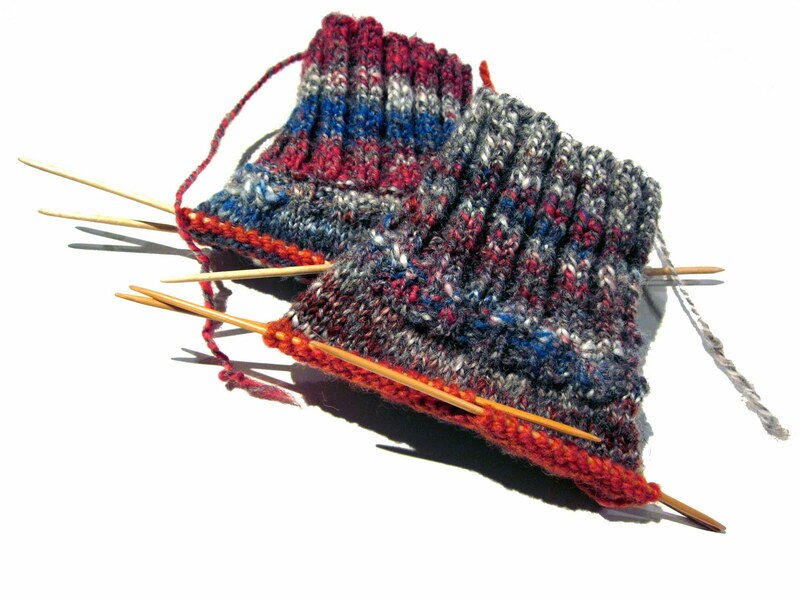 I have often thought that I should knit both mittens or socks simultaneously on two sets of needles. Is that what you do? April 26, 2011 at 9:26 p.m.